A heart-warming look at the timeless rituals and folklore of midwinter England. Mysterious and magical songs of wassailing, wren-hunting, stirring the fire and incessant feasting come dressed up in a glittering finery of toe-tapping tunes and cracking choruses. Add a smattering of hilarious original songs and a sprinkling of carols both familiar and unfamiliar, all stirred up with John’s usual panache and supported by his scintillating skill on squeezeboxes, and you have the recipe for a rattling good sing, guaranteed to keep the spirits cheery and the cold at bay. 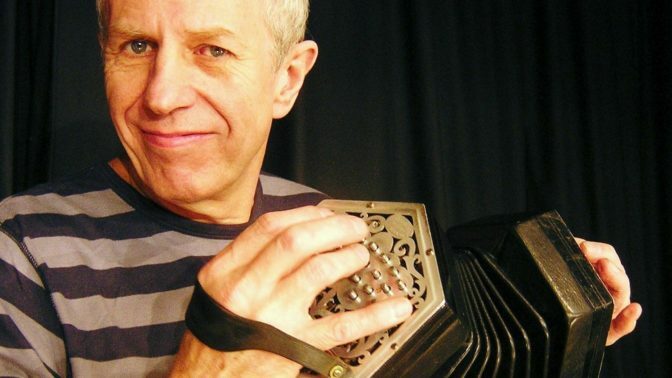 One of the most prolific figures on the English folk scene, John Kirkpatrick is a master of the free reed instrument, playing melodeon, button accordion and anglo concertina, as well as having an enviable reputation as a fine singer and interpreter of English folk music. John has performed solo, in duos, acoustic groups and electric bands; he has been a member of the Albion Country Band, Magic Lantern, The Richard Thompson Band, Umps and Dumps, Steeleye Span, Brass Monkey, Trans-Europe Diatonique, and Band of Hope, as well as numerous ceilidh bands.